When most people from the West hear the word Mandalay, they picture casinos, neon lights or even an aquarium. Mandalay Bay in Las Vegas, it turns out, was actually named after Myanmar’s former capital, despite its lack of a bay. But other than the name, the two places couldn’t be more different. Originally founded in 1857, Myanmar’s second city is home to some gorgeous temples, a haunted monastery, and even ‘the world’s largest book.’ You can also enjoy an excellent sunset from the top of Mandalay Hill. Luckily for the time-restrained traveler, most of the city’s main spots can conveniently be explored in a single day on foot. But where’s the best place to start? Regardless of where you’re staying, let’s begin at the mammoth moat in the center of town. 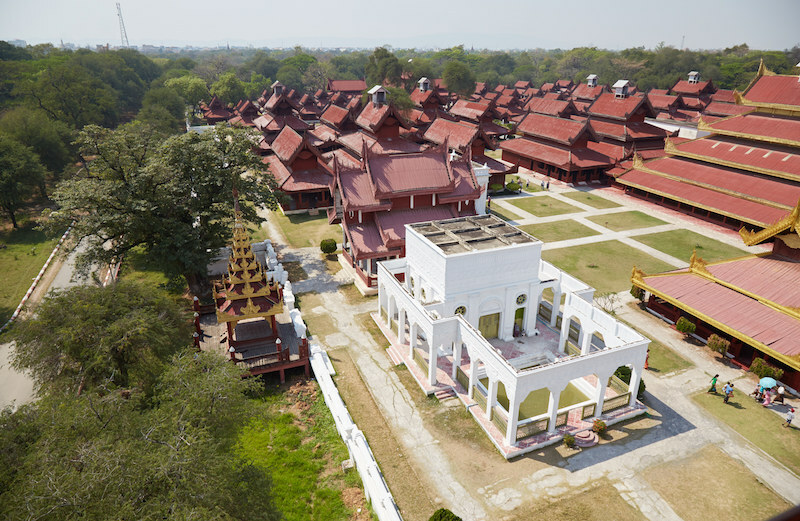 Looking at a map of Mandalay, you’ll easily notice the massive square-shaped moat surrounding the Mya Nan San Kyaw Golden Palace, also sometimes just called ‘Mandalay Palace.’ This is where you’ll want to start your journey, but be aware that the palace’s only entrance (for foreigners, that is) is located on its east side. Coming from the west side of the city will require an extra thirty-minute walk or so around the moat. But that’s not necessarily a bad thing. Not only is the water pleasant to look at, but the walkway is almost entirely shaded by trees. Furthermore, it contains virtually no foot traffic, making this perfect for a tranquil stroll in an otherwise hectic city of 1.7 million. If you find yourself walking from the west, check out this bizarre unnamed restaurant on Pinya St. Eat some local Burmese food with a wide open view of the street below. This family-run establishment operates as a normal restaurant, as if it were no big deal that the building is entirely missing a wall! There are no guard rails so make sure not to fall off. Once you finally make it to the moat’s east side, you’ll be requested to buy a ticket for 10,000 kyats. That may sound like a lot, but this same ticket will grant you access to many other sites in Mandalay. It’s also required at some places in the neighboring ancient capitals, like Inwa. Just be sure not to lose it! The Golden Palace, it turns out, is now home to a modern military base and you’ll have to deal with some men in uniform before entering. Aside from the Mandalay Archaeological Zone ticket, the soldiers will also demand some form of ID upon entry. Even if you don’t have it, though, they’re fairly flexible and will eventually settle for a blurry smartphone picture. They may even ask for your hotel room key to hold onto until you come back out. Access to the palace requires a walk through the large military complex. Don’t be surprised to catch the army marching band rehearsing some tunes on your way there. After such a long walk, finally arriving at the center of the compound is, well, somewhat anticlimactic. This is mainly because most of the wooden buildings are reconstructions of what were destroyed during World War II. Furthermore, with a few exceptions, most of them cannot be entered. So why bother with the Golden Palace at all? While this may be the least interesting spot on this itinerary, the palace is still worth a visit if you have a full day to dedicate to central Mandalay. Make the most of your 10,000 kyats and use the Mandalay Archaeological Zone ticket as much as possible! Back at the east gate of the moat, you now have a 15 – 20 minute walk before reaching the magnificent Shwenendaw Monastery. On the way, look out for the air-conditioned department store with coffee shops and a supermarket if you need a quick break from the heat. 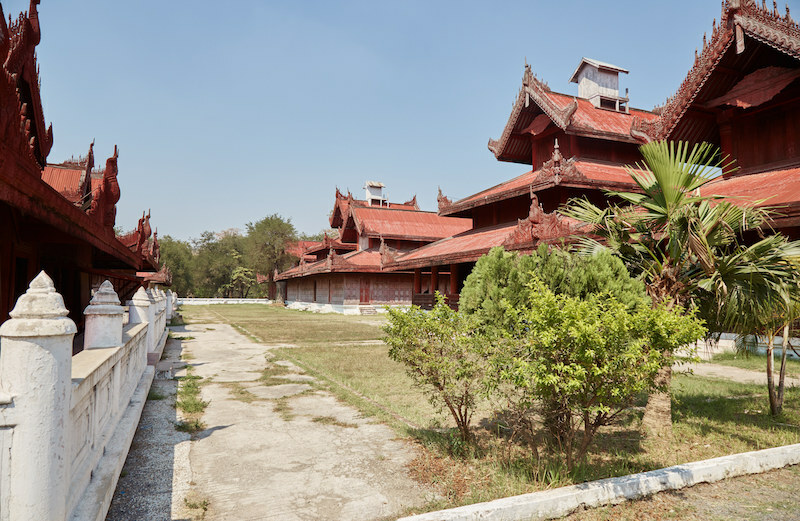 The Shwenendaw Monastery, built completely out of teak in the 18th century, was actually once part of the Mandalay Golden Palace. It was moved to its current location and converted into a monastery back in 1880. Visiting this intricately carved structure will give you an idea of what the Golden Palace buildings used to look like before they were burned down in the war. But why did this particular structure ever move in the first place? In 1878, King Thibaw Min demanded that what would eventually become Shwenandaw Monastery be completely dismantled and relocated. He suspected that the building was being haunted by the restless spirit of his father, Mandalay’s previous ruler. Considering what happened to all the other buildings in the Golden Palace, we now have Thibaw Min’s fear of ghosts to thank for still being able to visit the building today. Amazingly, 1878 was not the first time that it was dismantled and relocated. The teak structure was originally built in the neighboring town and former capital of Amarapura (of U-Bein bridge fame). Much of what made up the former Amarapura Royal Palace was transported over to Mandalay after it was decided that the capital would change locations. Why? As you’ll learn more about in the section on Mandalay Hill, it was done to fulfill an ancient prophecy made by the Buddha himself. The inside of the monastery reveals that it was once all painted gold, which also explains how the Golden Palace earned its name. 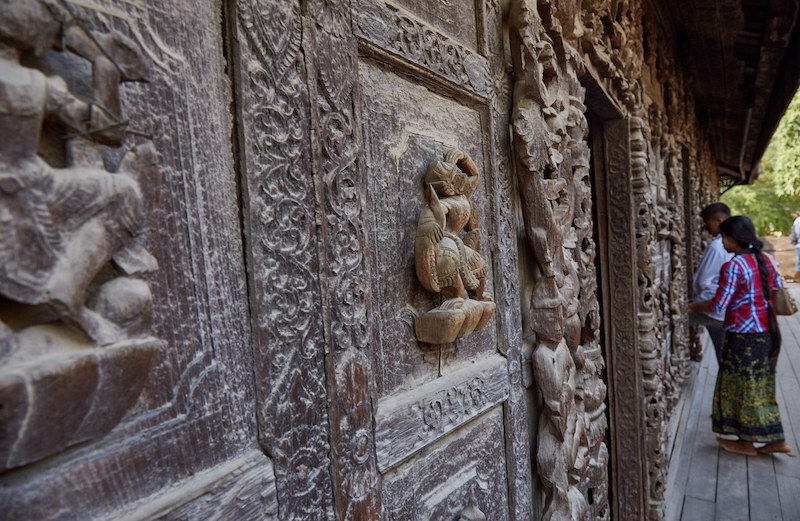 The detailed carvings on the doors and walls depict scenes of the Jataka tales, or the adventures of Buddha in his previous incarnations. The main Buddha image in the center of the monastery also features an appearance by Myanmar’s local animistic spirits known as the Nats, who can be seen worshipping the Buddha. Stepping outside, the complex also features a larger building known as the Atumashi Monastery, constructed in 1857. With its golden pillars and marble floors, this is a beautiful building both inside and out. The interior, however, is mostly empty aside from yet another golden Buddha statue. Heading just 6 or 7 minutes north of the monasteries, you’ll soon arrive at Kuthodaw Pagoda, also known as ‘The World’s Largest Book.’ But how could something be both a pagoda and a book at the same time? The book, which is the holy Buddhist scripture known as the ‘Tripitaka,’ is spread out amongst over 700 marble slabs. Each slab is then housed in its own little structure lined throughout the compound, making the ‘book’ feel more like a miniature town. 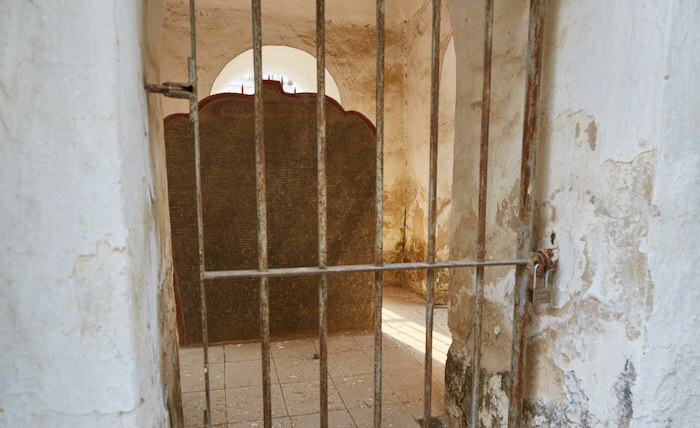 In order to read the book, language issues notwithstanding, you’d have to squint through the cage doors protecting each slab on a bright and sunny day. The slabs were originally much easier to read, though, as the letters were once painted with gold. During their reign, the British colonialists looted the pagoda, removing the gold from each of the 729 slabs and caused plenty of other damage. Thanks to a decades long restoration effort, the world’s largest book still makes for a fascinating visit. 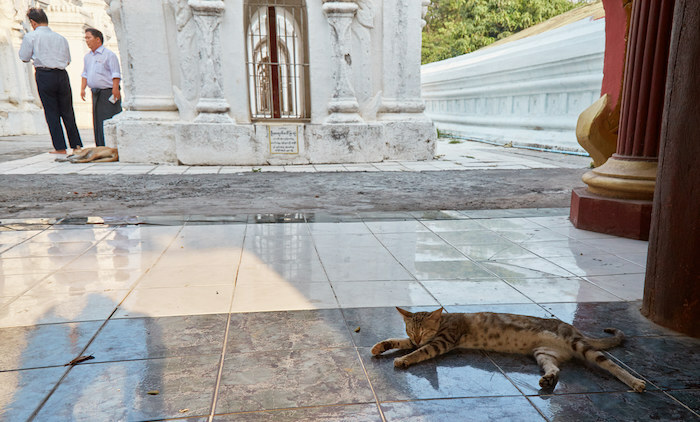 By now it’s likely late in the afternoon and you’ll want to start making your way up Mandalay Hill. 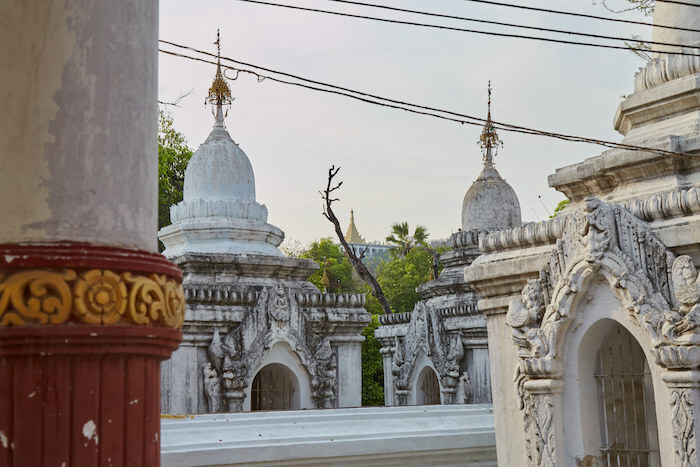 If you’re not already all ‘templed out’ by now, something many visitors to Myanmar tend to experience, you may consider making a brief stop at the Kyauk Taw Gyi Pagoda. 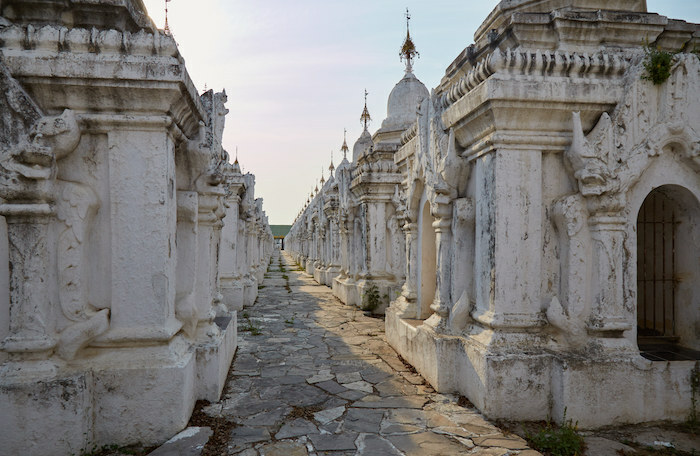 This pagoda is home to the country’s largest marble Buddha, standing at 37 feet tall. Otherwise, you can start making your way up the steps to the top of Mandalay Hill. Standing at 240 meters tall, Mandalay Hill is what the city of Mandalay itself was named after. 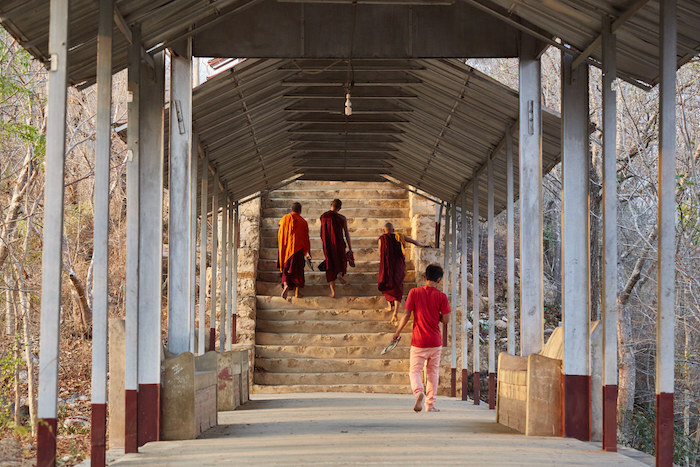 Like many hills and mountains in Myanmar, Mandalay Hill is considered a holy one, and you’ll discover a number of temples on your way to the top. 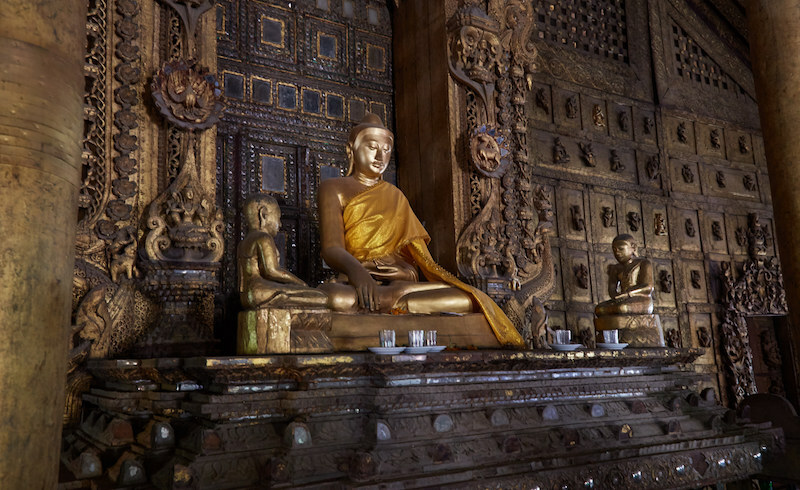 In fact, locals believe that the Buddha himself visited Mandalay Hill. There, he prophesized that a great Buddhist kingdom would flourish at the spot a couple thousand years in the future – the year 1857 to be exact. In order to fulfill the prophecy, the rulers of Myanmar at the time moved the capital to Mandalay from neighboring Amarapura, bringing a number of structures like the Shwenandaw Monastery along with them. The top of Mandalay Hill accessible by vehicle, but if you’re not too tired, it’s a relatively easy climb up several staircases. Along the way, stop to appreciate the views of the cityscape. The landmarks which you’ve just visited in person are all within view. Mandalay Hill can be deceiving. Just when you think you’ve reached the top, you’ll come across another staircase in the back of a temple area which takes you even higher. This seems to happen again and again. Some of the lower plateaus, however, provide the best overall views, so don’t feel too pressured to make it all the way to the top. 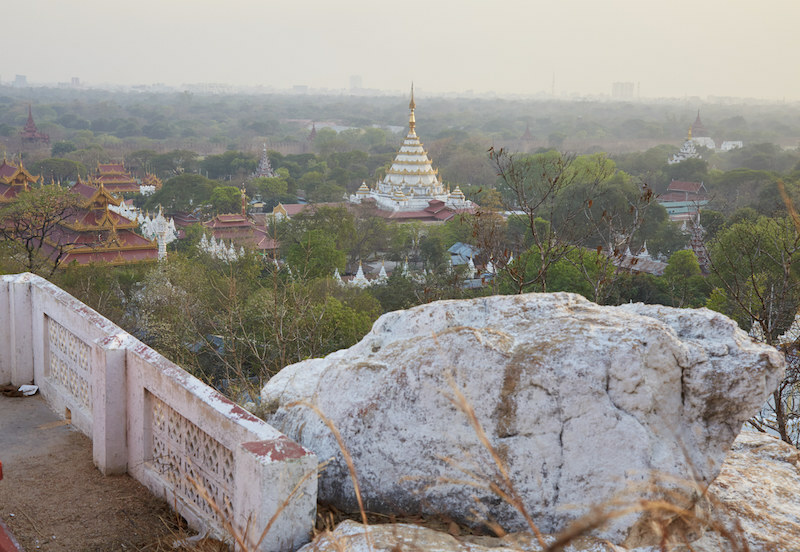 Despite being the perfect place to watch the sunset, Mandalay Hill doesn’t get too crowded with visitors in the evenings. After a long day of walking and climbing, it’s finally time to relax as you watch the sun go down over Myanmar’s second city. If you don’t have an extra day to tour around the region’s ancient capitals, you may want to start this walking tour earlier in the morning and hire a driver to take you to see the sunset over Amarapura’s iconic U-Bein bridge. Just understand that nearly every other tourist in Mandalay will have the same idea. 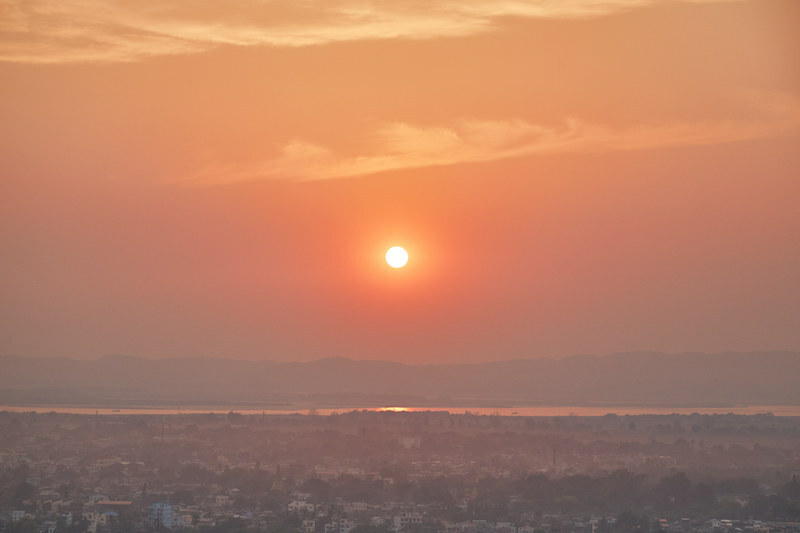 If you happen to be staying in the western part of the city, the sunsets over the Irrawaddy River are also excellent. If you still have any energy left after nightfall, consider taking a stroll through the Zay Cho night market. While Mandalay lacks much of any nightlife to speak of, you also shouldn’t have to wander too far to find somewhere serving the local ‘Myanmar’ brand beer along with some snacks. BY PLANE: There are a number of way to reach Mandalay. The city hosts an international airport and direct flights are available to and from cities such as Bangkok, Chiang Mai, Singapore, Hong Kong and Kunming, China. BY TRAIN OR BUS: The city is also accessible by either train or bus from Yangon, Bagan or Inle Lake. BY BOAT: Another popular way to reach Mandalay from Bagan is a boat ride along the Irrawaddy River. The cheaper ‘express’ option ($35 USD) takes around 12 hours and you can read all about it here. while luxury cruises are also available. As mentioned, most of the major locations can be reached on foot, but you will probably want to take a taxi back to your hotel at the end of the day. Both regular and motorbike taxis are abundant throughout the city. Most taxis don’t have meters so you’ll need to work out a price before the ride. In general, taxi drivers in Myanmar are a lot easier to deal with than in other Southeast Asian countries and it’s not hard to agree on a fair price. If you’d like to see the sites mentioned above without all the walking, a daily driver can be hired for around $40 USD. This should also leave you plenty of time left to see even more sites. Simply ask at your hotel and they should be able to arrange one for you. If you want to see the nearby ancient capitals of Inwa, Sagaing and Amarapura, these are best visited on a separate day. That’s why you should arrange for at least 2 full days in the Mandalay area. Mandalay is a fairly small city so basing yourself relatively close to the moat should be good enough to reach all of the major sites. Independent apartment or vacation rentals aren’t allowed in Myanmar so you’ll only be able to stay at licensed hotels. There are plenty of options in Mandalay, ranging from budget backpacker hostels with shared bathrooms to luxury hotels.